On this Date in History: Assassination of King George I of the Hellenes. Alexandros Schinas, Assassination, Christian IX of Denmark, George I of Greece, King George I of the Hellenes, Kingdom of Greece, Kingdom of the Hellenes, Otto of Greece, United Kingdom of Great Britain and Northern Ireland. George I of Greece (1863-1913) was originally a Danish prince, the second son and third child of Prince Christian of Schleswig-Holstein-Sonderburg-Glücksburg (future King Christian IX of Denmark) and Princess Louise of Hesse-Kassel. George was born on December 24, 1845 at the Yellow Palace, an 18th-century town house at 18 Amaliegade, right next to the Amalienborg Palace complex in Copenhagen. Until his accession in Greece, he was known as Prince Wilhelm, the namesake of his grandfathers Wilhelm, Duke of Schleswig-Holstein-Sonderburg-Glücksburg, and Prince Wilhelm of Hesse-Kassel. George was destined for a career in the Royal Danish Navy. He was only 17 years old when he was elected king by the Greek National Assembly, which had deposed the unpopular former king Otto (second son of King Ludwig I of Bavaria and Therese of Saxe-Hildburghause). His nomination was both suggested and supported by the Great Powers: the United Kingdom of Great Britain and Ireland, the Second French Empire and the Russian Empire. He married the Russian grand duchess Olga Constantinovna of Russia, and became the first monarch of a new Greek dynasty. The death of Britain’s Queen Victoria on January 22, 1901 left King George as the second-longest-reigning monarch in Europe. His always cordial relations with his brother-in-law, the new King Edward VII, continued to tie Greece to Britain. This was abundantly important in Britain’s support of King George’s second son Prince George as Governor-General of Crete. Nevertheless, Prince George resigned in 1906 after a leader in the Cretan Assembly, Eleftherios Venizelos, campaigned to have him removed. As a response to the Young Turk Revolution of 1908, Venizelos’s power base was further strengthened, and on October 8, 1908 the Cretan Assembly passed a resolution in favor of union despite both the reservations of the Athens government under Georgios Theotokis and the objections of the Great Power. The muted reaction of the Athens Government to the news from Crete led to an unsettled state of affairs on the mainland. In August 1909, a group of army officers that had formed a military league, Stratiotikos Syndesmos, demanded, among other things, that the royal family be stripped of their military commissions. To save the King the embarrassment of removing his sons from their commissions, they resigned them. The military league attempted a coup d’état, and the King insisted on supporting the duly elected Hellenic Parliament in response. Eventually, the military league joined forces with Venizelos in calling for a National Assembly to revise the constitution. King George gave way, and new elections to the revising assembly were held in August 1910. After some political maneuvering, Venizelos became prime minister of a minority government. Just a month later, Venizelos called new elections for December 11, 1910, at which he won an overwhelming majority after most of the opposition parties declined to take part. Venizelos and the King were united in their belief that the nation required a strong army to repair the damage of the humiliating defeat of 1897. Crown Prince Constantine was reinstated as Inspector-General of the Army, and later Commander-in-Chief. Under his and Venizelos’s close supervision the military was retrained and equipped with French and British help, and new ships were ordered for the Hellenic Navy. Meanwhile, through diplomatic means, Venizelos had united the Christian countries of the Balkans in opposition to the ailing Ottoman Empire. When the Kingdom of Montenegro declared war on Turkey on October 8, 1912, it was joined quickly by Serbia, Bulgaria, and Greece in what is known as the First Balkan War. George was on vacation in Denmark, so he immediately returned to Greece via Vienna, arriving in Athens to be met by a large and enthusiastic crowd on the evening of 9 October. The results of this campaign differed radically from the Greek experience at the hands of the Turks in 1897. The well-trained Greek forces, 200,000 strong, won victory after victory. On November 9, 1912, Greek forces commanded by Crown Prince Constantine rode into Thessaloniki, just a few hours ahead of a Bulgarian division. Three days later King George rode in triumph through the streets of Thessaloniki, the second-largest Greek city, accompanied by the Crown Prince and Venizelos. As he approached the fiftieth anniversary of his accession, the King made plans to abdicate in favor of his son Constantine immediately after the celebration of his golden jubilee in October 1913. Just as he did in Athens, George went about Thessaloniki without any meaningful protection force. While out on an afternoon walk near the White Tower on March 18, 1913, he was shot at close range in the back by Alexandros Schinas, who was “said to belong to a Socialist organization” and “declared when arrested that he had killed the King because he refused to give him money.” George died instantly, the bullet having penetrated his heart. The Greek government denied any political motive for the assassination, saying that Schinas was an alcoholic vagrant. Schinas was tortured in prison and six weeks later fell to his death from a police station window. The King’s body was taken to Athens on the Amphitrite, escorted by a flotilla of naval vessels. For three days the coffin of the King, draped in the Danish and Greek flags, lay in the Metropolitan Cathedral in Athens before his body was committed to a tomb at his palace in Tatoi. Crown Prince Constantine succeeded his father as the new king of the Hellenes. Election of the King of the Hellenes. On this date in History: March 30, 1863. Prince Wilhelm of Denmark was elected as King of the Hellenes (Greece). George I (born Prince Wilhelm of Schleswig-Holstein-Sonderburg-Glücksburg; 24 December 24, 1845 – March 18, 1913) was King of the Hellenes (Greece) from 1863 until his assassination in 1913. George was born at the Yellow Palace, an 18th-century town house at 18 Amaliegade, right next to the Amalienborg Palace complex in Copenhagen. He was the second son of Prince Christian of Schleswig-Holstein-Sonderburg-Glücksburg (Christian IX of Denmark) and Princess Louise of Hesse-Cassel. Although his full name was Prince Christian Wilhelm Ferdinand Adolf Georg of Schleswig-Holstein-Sonderburg-Glücksburg, until his accession in Greece, he was known as Prince Wilhelm the namesake of his paternal and maternal grandfathers, Wilhelm, Duke of Schleswig-Holstein-Sonderburg-Glücksburg, and Prince Wilhelm of Hesse-Cassel. Although he was of royal blood, his family was relatively obscure and lived a comparatively normal life by royal standards. In 1853, however, George’s father was designated the heir presumptive to the childless King Frederik VII of Denmark, and the family became princes and princesses of Denmark. George’s siblings were Frederik (who succeeded their father as King of Denmark), Alexandra (who became wife of King Edward VII of the United Kingdom and the mother of King George V), Dagmar (who, as Empress Maria Feodorovna, was consort of Emperor Alexander III of Russiaand the mother of Emperor Nicholas II), Thyra (who married Prince Ernest Augustus, 3rd Duke of Cumberland and Teviotdale) and Valdemar. Following the overthrow of the Bavarian-born King Otto of Greece (son of King Ludwig I of Bavaria and Therese of Saxe-Hildburghausen) in October 1862, the Greek people had rejected Otto’s brother and designated successor Leopold, although they still favored a monarchy rather than a republic. Many Greeks, seeking closer ties to the pre-eminent world power, Great Britain, rallied around Prince Alfred, Duke of Edinburgh, second son of Queen Victoria and Prince Albert. British prime minister Lord Palmerston believed that the Greeks were “panting for increase in territory”, hoping for a gift of the Ionian Islands, which were then a British protectorate. The London Conference of 1832, however, prohibited any of the Great Powers’ ruling families from accepting the crown, and in any event, Queen Victoria was adamantly opposed to the idea. The Greeks nevertheless insisted on holding a plebiscite in which Prince Alfred received over 95% of the 240,000 votes. There were 93 votes for a Republic and 6 for a Greek.King Otto received one vote. Prince Alfred was also the designated heir to his uncle, Ernst II, Duke of Saxe-Coburg-Gotha should the Duke remain childless. With Prince Alfred’s exclusion, the search began for an alternative candidate. The French favored Henri d’Orléans, duc d’Aumale, while the British proposed Queen Victoria’s brother-in-law Ernst II, Duke of Saxe-Coburg and Gotha, her nephew Prince Leiningen, and Archduke Maximilian of Austria, among others. Eventually, the Greeks and Great Powers winnowed their choice to Prince William of Denmark, who had received 6 votes in the plebiscite. Aged only 17, he was elected King of the Hellenes on March 30, 1863 by the Greek National Assembly under the regnal name of George I. Paradoxically, he ascended a royal throne before his father, who became King Christian IX of Denmark on November 15 of the same year. There were two significant differences between George’s elevation and that of his predecessor, Otto. First, he was acclaimed unanimously by the Greek Assembly, rather than imposed on the people by foreign powers. Second, he was proclaimed “King of the Hellenes” instead of “King of Greece”, which had been Otto’s style. King George I is the paternal grandfather of HRH The Duke of Edinburgh, husband of HM Queen Elizabeth II of the United Kingdom and born Prince Philip of Greece and Denmark. Marriage of Prince Albert-Edward, Prince of Wales and Princess Alexandra of Denmark. On this date in History: March 10, 1863. Marriage of Prince Albert-Edward, Prince of Wales and Princess Alexandra of Denmark. In September 1861, Albert-Edward, Prince of Wales was sent to Germany, supposedly to watch military manoeuvres, but actually in order to engineer a meeting between him and Princess Alexandra of Denmark, the eldest daughter of Prince Christian of Denmark (future King Christian IX) and his wife Louise of Hesse-Cassel. Queen Victoria and Prince Albert had already decided that Albert-Edward and Alexandra should marry. They met at Speyer on September 24 under the auspices of his elder sister, Victoria, Princess Royal who had married the Crown Prince Friedrich-Wilhelm of Prussia in 1858. Albert-Edward’s elder sister, acting upon instructions from their mother, had met Princess Alexandra at Strelitz in June; the young Danish princess made a very favourable impression. Albert-Edward and Alexandra were friendly from the start; the meeting went well for both sides, and marriage plans advanced. Once widowed, Queen Victoria effectively withdrew from public life. Shortly after Prince Albert’s death, she arranged for Albert-Edward to embark on an extensive tour of the Middle East, visiting Egypt, Jerusalem, Damascus, Beirut and Constantinople. The British Government wanted Albert-Edward to secure the friendship of Egypt’s ruler, Said Pasha, to prevent French control of the Suez Canal if the Ottoman Empire collapsed. It was the first royal tour on which an official photographer, Francis Bedford, was in attendance. As soon as Albert-Edward returned to Britain, preparations were made for his engagement, which was sealed at Laeken in Belgium on September 9, 1862. Albert-Edward married Alexandra at St George’s Chapel, Windsor Castle, on March 10, 1863. He was 21; she was 18. In examining the grief born by the Prince of Wales-Edward VII from July 1900 to August of 1901 our story turns to the relationship he had with his brother, HRH Prince Alfred, Duke of Edinburgh and reigning Duke of Saxe-Coburg Gotha. HRH Prince Alfred Ernest Albert was born on August 6, 1844 and was the second son and fourth child of Queen Victoria of the United Kingdom and Prince Albert of Saxe-Coburg and Gotha. He was created Duke of Edinburgh by his mother in 1866 and he succeeded his paternal uncle Ernst II as the reigning Duke of Saxe-Coburg and Gotha in the German Empire on August 22, 1893. On 23 January 1874, the Duke of Edinburgh married Her Imperial Highness the Grand Duchess Maria Alexandrovna of Russia, the second (and only surviving) daughter of Emperor Alexander II of Russia and his wife Marie of Hesse and by Rhine (daughter of Ludwig II, Grand Duke of Hesse and by Rhine and Wilhelmine of Baden) at the Winter Palace, St Petersburg. The marriage was not a happy one and the Duchess of Edinburgh was thought haughty by London Society. Perhaps there was great truth to this claim and it is evident by her displeasure when she learned that she had to yield precedence to the Princess of Wales and all of Queen Victoria’s daughters. The Duchess of Edinburgh persistently insisted on taking precedence before the Princess of Wales (the future Queen Alexandra) because she considered the Princess of Wales’ family (King Christian IX and the rest of the Danish Royal Family) as inferior to their own. The Duchess ‘ father, Emperor Alexander II of Russia, shared this opinion. However, Queen Victoria refused this demand, yet in the end compromised with her daughter-in-law and granted her precedence immediately after the Princess of Wales. To his credit, Prince Albert Edward, Prince of Wales did not allow this issue to dampen relations with his brother. In fact, shortly after the incident, The prince of Wales invited the Czarevitch (future Emperor Alexander III) and his family to Marlborough House, the London residence of the prince and Princess of Wales. During this visit he forged a close relationship with his nephew, the future Emperor Nicholas II of Russia. What I find interesting, and need to read more about this prejudice the Emperor Alexander II had toward the family of King Christian IX of Denmark, is that Alexander II’s own son, future Emperor Alexander III, was, like the prince of Wales, married to a daughter (Princess Dagmar) of King Christian IX of Denmark! Does this mean he didn’t approve of his own daughter-in-law? On the death of his uncle, Ernst II, Duke of Saxe-Coburg and Gotha on August 22, 1893, the duchy fell to the Duke of Edinburgh, since The Prince of Wales had renounced his right to the succession before he married. Alfred thereupon surrendered his seats in the House of Lords and the Privy Council, but he retained Clarence House as his London residence. At first regarded with some coldness as a “foreigner”, he gradually gained popularity. By the time of his death in 1900, he had generally won the good opinion of his subjects. Duke Alfred of Saxe-Coburg and Gotha died of throat cancer on July 30, 1900. He was buried at the ducal family’s mausoleum in the Friedhof am Glockenberg (de) in Coburg. Alfred was succeeded as the Duke of Saxe-Coburg and Gotha by his nephew, Prince Charles Edward, Duke of Albany, the posthumous son of his youngest brother, Prince Leopold, Duke of Albany because Alfred’s next brother, The Duke of Connaught, and his son, Prince Arthur of Connaught, had renounced their succession rights to the Duchy of Saxe-Coburg and Gotha. Who was the first King of Denmark? Christian I of Denmark, Christian II of Denmark, Christian IX of Denmark, Christopher of Bavaria., Eric VII of Pomerania, Gorm the Old, King Harald V of Norway, King of Denmark, Queen Margrethe II of Denmark. Now we direct our attention to the three Scandinavian countries of Denmark, Norway and Sweden. Like England and Scotland much of the early history of these monarchies are shrouded in myths and legends. We have many names for these per-histtorical kings but many are legendary and may not have existed at all. Denmark is such a country shrouded in these myths. For example, Gyrd and Gnupa were alleged kings of Denmark and ruled during part of the 10th century according to King Sweyn II of Denmark and Adam of Bremen. They were the sons of the Swedish chieftain Olaf the Brash who was said to have conquered Denmark, ruling jointly, according to Swedish tradition. Did they actually exist? King Gnupa is mentioned on the two Sigtrygg Runestones found near Schleswig by his wife Asfrid for their son Sigtrygg. Also, a Danish king Chnuba is named by Widukind of Corvey in his Saxon Chronicles as having been defeated and was forced to accept Christian baptism at the hands of King Gnupa in 934. There is a saga by Olav Tryggvasson’s that tells of Gnupa’s defeat by Gorm the Old. The problem with this claim is that it contradicts the chronology of Adam of Bremen, who places the succession and subsequent defeat of Sigtrygg during the tenure of Archbishop Hoger of Bremen (909-915/7). These conflicting dates influenced Gesta Danorum of Saxo Grammaticus who names a nobleman, Ennignup, who allegedly served as a guardian for a young king Canute I at some time prior to accession King Gorm the Old and it has been suggested this may be confused representation of King Gnupa. With all of that confusion Gorm the Old is the first historically recognized King of Denmark, reigning from c. 936 to his death c. 958. He ruled from Jelling, and made the oldest of the Jelling Stones in honor of his wife Thyra. Gorm was born before 900 and died c. 958. King Gorm is the reported to be the son of semi-legendary Danish king Harthacnut. Chronicler Adam of Bremen says that Harthacnut came from Nortmannia to Denmark and seized power in the early 10th century. He deposed the young king Sigtrygg Gnupasson, reigning over Western Denmark. When Harthacnut died, Gorm ascended the throne. Conflicting reports mention Gorm taking at least part of the kingdom by force from Gnupa, and Adam himself suggests that the kingdom may have divided prior to Gorm’s time. Gorm is first mentioned in extant documents as the host of Archbishop Unni of Hamburg and Bremen in 936. Despite the historical certainty of Gorm as King of Denmark it is recorded that Denmark was not completely unified during his reign. According to the ancient Jelling Stones it was Gorm’s son, Harald Bluetooth, brought together the various tribes in Denmark under one rule. This leads historians to speculate that Gorm only ruled Jutland from his seat in Jelling. As in the other nations in this series I have looked at what the exact titles were in the past and Denmark will be no exception. The monarchs of Denmark have a long history of royal and noble titles. Historically Danish monarchs also used the titles ‘King of the Wends’ and ‘King of the Goths’ along with the title King of Denmark. Here is a select list of titles born by the kings of Denmark. Eric VII of Pomerania: By the Grace of God, King of Denmark, Sweden and Norway, the Wends and the Goths, Duke of Pomerania. Christopher I of Bavaria: By the Grace of God, King of Denmark, Sweden and Norway, the Wends and the Goths, Count Palatine of the Rhine, Duke of Bavaria. The full title of the Danish sovereigns from Christian I to Christian II was: By the Grace of God, King of Denmark, Sweden and Norway, the Wends and the Goths, Duke of Schleswig, Holstein, Stormarn and Dithmarschen, Count of Oldenburg and Delmenhorst. Christian II’s successor, Frederik I, didn’t style himself King of Norway because he never visited the country. Therefore he was never crowned King of Norway, so he styled himself King of Denmark, the Vends and the Goths, elected King of Norway. King Frederick VII of Denmark died on November 15, 1863 and despite two marriages he did not leave any heirs. 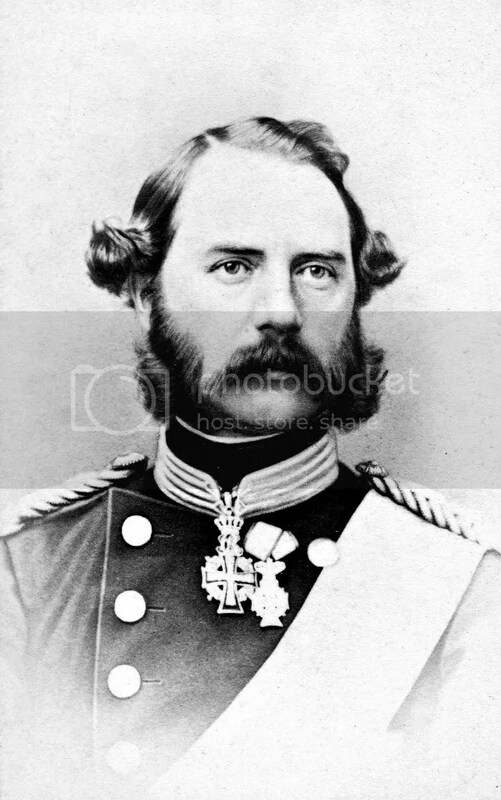 Therefore under the agreement of the London Protocol of 1852 Prince Christian of Schleswig-Holstein-Sonderburg-Glücksburg, a junior branch of the House of Oldenburg, mounted the throne as King Christian IX. Since the balance of power between the sovereign and parliament was still in dispute, therefore, the early part of his reign was dominated by political disputes. In spite of his initial unpopularity and the many years of political strife, where the king was in conflict with large parts of the population, his popularity recovered towards the end of his reign, and he became a national icon due to the length of his reign and the high standards of personal morality with which he was identified. Christian IX died in 1906 and was succeeded by his eldest son as King Frederik VIII. Frederik was liberal and he had a much more favorable to the new parliamentarian system than his father had. He came to the throne very late in life and was already in ill health and reigned for a short period, dying in 1912. His son and successor, Christian X, faced a constitutional crisis, one of the largest crisis since the adoption of the constitution in 1849. The conflict was over the long debated issue of the reunification with Denmark of Schleswig, a former Danish fiefdom, which had been lost to Prussia during the Second War of Schleswig. The King and the cabinet were in dispute over this issue. One of the issues was the future of the city of Flensburg, in Central Schleswig. A plebiscite was to decide whether or not to return central Schleswig to either Denmark or Germany. Danish nationalists felt that at least that city should be returned to Denmark regardless of the plebiscite’s results. Christian X agreed with this premise and ordered Prime Minister Zahle to include Flensburg in the re-unification process. Zahle felt he was under no obligation to comply. He refused the order and resigned several days later after a heated exchange with the King. Afterward, Christian X dismissed the rest of the cabinet and replaced it with a conservative cabinet. The dismissal caused an almost revolutionary atmosphere in Denmark, and for several days the future of the monarchy seemed very much in doubt. Christian X, seeing the light of this, opened between the crown and members of the Social Democrats. Realizing the monarchy was about to be overthrown he backed down on his demands and dismissed his conservative cabinet, installing a compromise cabinet until elections could be held later that year. This was the last time a sitting Danish monarch attempted to take political action without the full support of parliament. Following the crisis, Christian X accepted his drastically reduced role and became a symbolic head of state. His son, Frederik IX (1947-1972, and granddaughter, Queen Margrethe II (1972-) have continued being non-political figureheads. Cut here from Wikipedia is the Danish monarchs’ Constitutional role. The Queen’s main tasks are to represent the Kingdom abroad and to be a unifying figurehead at home. She receives foreign ambassadors and awards honours and medals. The queen performs the latter task by accepting invitations to open exhibitions, attending anniversaries, inaugurating bridges, etc. As an unelected public official, the Queen takes no part in party politics and does not express any political opinions. Although she has the right to vote, she opts not to do so to avoid even the appearance of partisanship. After an election where the incumbent Prime Minister does not have a majority behind him or her, the Queen holds a “Dronningerunde” (Queen’s meeting) in which she meets the chairmen of each of the Danish political parties. Once the government has been formed, it is formally appointed by the Queen. Officially, it is the Queen who is the head of government, and she therefore presides over the Council of State, where the acts of legislation which have been passed by the parliament are signed into law. In practice, however, nearly all of the Queen’s formal powers are exercised by the Council of State, and she is required by convention to act on its advice. In addition to her roles in her own country, the queen is also the Colonel-in-Chief of the Princess of Wales’s Royal Regiment (Queen’s and Royal Hampshires), an infantry regiment of the British Army, following a tradition in her family. Next week, I will look at the conservative state of Prussia. 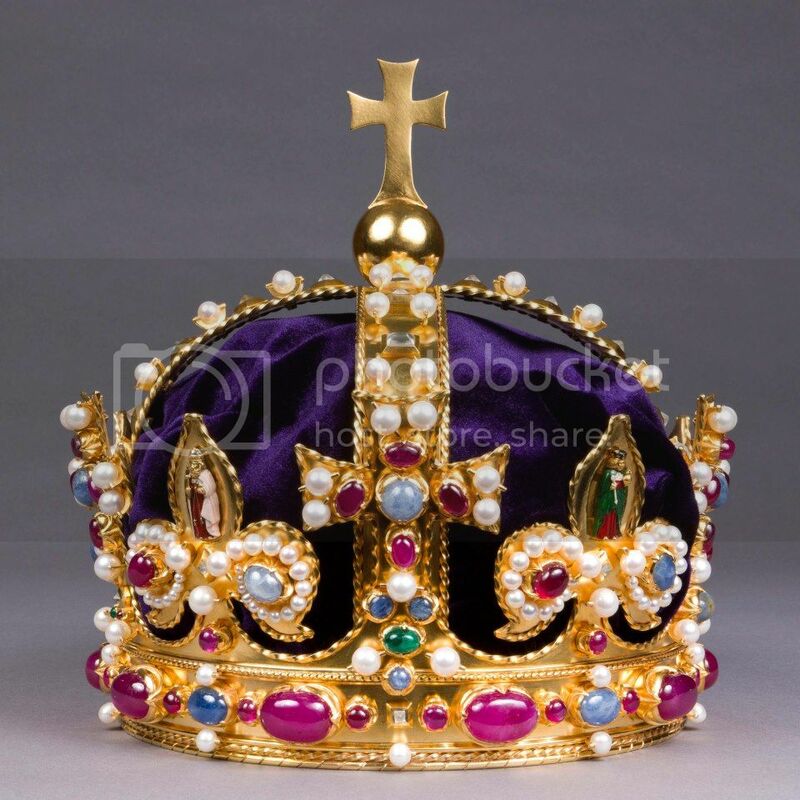 I wanted to revive an old feature, where I would focus on one monarch or prince/princess. The problem with that in the past was that it was difficult for me to keep it brief. I ended up writing way too much for a blog post. So, I will revive this feature and see if I can keep it brief!! HRH Prince Ernst-August II of Hanover, Duke of Cumberland. He was born in 21 September 1845 the eldest son of King Georg V of Hanover and Marie of Saxe-Altenburg. He was the grandson of Queen Victoria’s uncle, King Ernst-August I of Hanover. Prince Ernst-August’s father, Georg V of Hanover, lost the throne when it was annexed to Prussia in the 1866 war against Austria. As a descendant of King George III of Great Britain, Elector of Hanover, Prince Enrst-August II was heir to the vacant throne of Hanover and the Duchy of Brunswick as well as a British Prince and as Duke of Cumberland he was a British Peer. Because of Hanover’s annexation to Prussia Ernst-August had long deep-seated prejudice and hatred toward all things Prussian and the House of Hohenzollern. For that reason he took Princess Thyra of Denmark as his wife. Thyra was the youngest daughter of Christian IX of Denmark and Louise of Hesse-Kassel. The Danish Royal Family lost a war against Prussia in 1864 so they all shared a common hatred of Prussia. This marriage also made him the brother-in-law to King Frederik VIII of Denmark, King Edward VII of Great Britain, Emperor Alexander III of Russia and King George I of Greece. Queen Victoria appointed the Duke of Cumberland a colonel in the British Army in 1876 and promoted him to major-general in 1886, lieutenant-general in 1892 and general in 1898. After his time in the British Army he lived in Gmunden, Upper Austria. Although he never renounced the succession to the thrones of Hanover and Brunswick Ernst-August II was eventually reconciled to Prussia when his eldest surviving son, Ernst-August III, married Princess Victoria-Luise of Prussia, the only daughter of German Emperor Wilhelm II in 1913. That same year his son was created the reigning Duke of Brunswick by Wilhelm II. As a British and German Prince, Ernst-August II lost his British peerage in 1917 when all German relatives of the British Royal Family lost their British titles during World War I when King George V issued the Titles Deprivation Act. Prince Ernst August, the former Crown Prince of Hanover and former Duke of Cumberland, died of a stroke on his estate at Gmunden in November 1923. He was 78 years old. Immediately after he succeeded to the throne the question of the Schleswig-Holsein duchies came to a head. The issue lead to a short war with Prussia resulting in a loss of the duchies from Denmark. I will not relate the long complex history of the war here for in many ways it is more for the story on the unification of Germany than that of the reign of King Christian IX. The initial defeat tainted the early days of Christian’s reign and for a while made him unpopular. Increasing his unpopularity was his support of the authoritarian Prime Minister Estrup who ruled Denmark as a virtual dictator between 1875 and 1894. This occurred in an era when Parliamentary democracies were on the rise throughout Europe. His first step toward constitutionalism was when in 1874 he granted Iceland, a Danish possession at the time, its own constitution. It wasn’t however, given its independence. It wasn’t until 1901 when the king began allowing these types of transformations in Denmark. He begrudgingly asked Johan Henrik Deuntzer to form a government which resulted in the creation of the Cabinet of Deuntzer that included members of the Venstre Reform Party and was the first Danish government not to include the conservative party. This began the tradition of a Parliamentary style government and from then on until his death a few years later the poularity of Christian IX grew. Højre, even though Højre never had a majority of the seats in the Folketing. This was the beginning of the Danish tradition of parliamentarian democracy and this improved his reputation for his last years. Similarly to Queen Victoria, the Children and grand-children of King Christian IX and Queen Louise linked the Danish Royal Family to many other royal families of Europe. Queen Elizabeth II of the United Kingdom, King Albert II of Belgium, King Harald V of Norway, Queen Margrethe II of Denmark and Grand Duke Henri of Luxembourg. The consorts Prince Philip, Duke of Edinburgh, and Queen Sofía of Spain are also agnatic descendants of Christian IX, as is Constantine II of Greece (the former and last King of the Hellenes). The eldest son, future King Frederik VIII of Denmark, was married to Princess Louise of Sweden & Norway the daughter of King Carl XV of Sweden & Norway and his wife Princess Louise of the Netherlands. They had eight children and the first two became kings in their own right. The eldest, Prince Christian, became King Christian X of Denmark in 1912 and the second son, Prince Carl was elected to the throne of Norway when that country won its independence from Sweden in 1905. Prince Carl of Denmark married his paternal first cousin, Princess Maud of Wales, and upon accepting the throne of Norway he changed his name to Haakon and became King Haakon VII of Norway. Haakon & Maud are the grandparents of Norway’s current king, Harald V.
Christian IX’s eldest daughter, the lovely Princess Alexandra, married Prince Albert Edward, the Prince of Wales on 10 March 1863 married at St. George’s Chapel, Windsor Castle. With Queen Victoria still in official mourning for the Prince Consort the wedding was more like a funeral than a wedding. They had six children. The eldest son, Albert Victor, Duke of Clarence, died from pneumonia in 1892. The second eldest son became King George V of the United Kingdom and is the grandfather of the present queen, Elizabeth II. Their daughter Maud, married, as we have seen, her cousin, King Haakon VII of Norway. The next son, Prince Wilhelm of Denmark, entered the Danish Navy at the age of 17 and soon found himself elected to the throne of Greece. The unpopular King Otto of Greece was deposed in 1862 but Greece wanted to remain a monarchy. One of the first choices was Prince Alfred, the Duke of Edinburgh, second son of Britain’s queen Victoria, but this offer was declined. The choice then fell to Prince Wilhelm of Denmark who ascended the Greek throne as King George I of the Hellenes. Christian IX’s son became a king a few months before Christian himself inherited the Danish throne! King George I married Grand Duchess Olga Constantinovna of Russia, the daughter of Grand Duke f Grand Duke Constantine Nikolaievich and his wife Princess Alexandra of Saxe-Altenburg. George and Olga were the paternal grandparents of Prince Philip, Duke of Edinburgh, consort to Britain’s Queen Elizabeth II. The next child was Princess Dagmar. Initially she was betrothed Czarevich Nicolas Alexandrovich of Russia eldest son of Czar Alexander II of Russia. He did before the wedding and upon Nicholas’ wishes she married his younger brother in 1866 who became Czar Alexander III of Russia in 1881. She converted to the Russian Orthodox faith and was renamed Maria Feodorovna. They were also the parents of the ill-fatted and tragic Czar Nicholas II of Russia. At the start of the Russian Revolution she was able to leave Russia and return to Denmark where she died there in 1828. 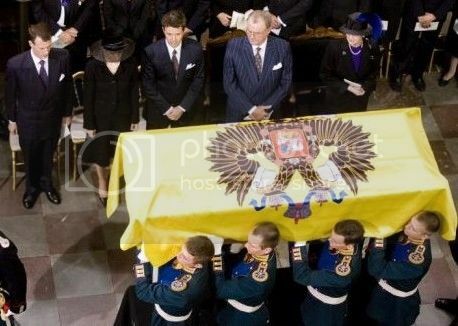 On September, 28 2006 the remains of Empress Maria Feodorovna were returned to Russia and after a service at Saint Isaac’s Cathedral, she was interred next to her husband Alexander III in the Peter and Paul Cathedral, 140 years after her first arrival to Russia. The last two children of Christian IX and Louise, Thyra and Waldemar, did not make as notable of marriages as their older siblings. Thyra married, Ernst August II, Duke of Cumberland, Prince of Hanover and the United Kingdom of Great Britain. Ernst August was heir to the defunct throne of Hanover which lost its throne in the war against Prussia during the time of German Unification. Thyra’s and Ernst’s son, Ernst August III, married Victoria-Louise of Prussia, the only daughter of German Emperor Wilhelm II, as a means of mending fences. Their descendents did marry into both the Greek and Spanish thrones. Waldemar married Princess Marie d’Orleans in 1885. Princess Marie d’Orleans was the daughter of Prince Philippe VII, Comte d’Paris, pretender to the French throne. King Christian IX died on February 15, 1906 at the age of 87 and after a reign of 43 years. An interesting King who lived through very interesting times and whose descendants still occupy the thrones of Europe. The story of Christian IX of Denmark is an interesting tale of his rise as an obscure member of the House of Schleswig-Holstein-Sonderburg-Glücksburg, a collateral branch of the House of Oldenburg which had ruled Denmark and Norway for centuries, to becoming King of Denmark in his own right. Today he is called the father-in-law of Europe and a majority of the royals sitting on the thrones of Europe are a descendants of his. He was born in Gottorp on April 8, 1818. His Serene Highness Prince Christian of Schleswig-Holstein-Sonderburg-Beck was the fourth son of Duke Friedrich Wilhelm of Schleswig-Holstein-Sonderburg-Beck and Princess Louise Caroline of Hesse-Cassel. In 1825 Duke Friedrich Wilhelm inherited the Duchy of Glücksburg and changed his title accordingly. At the time of his birth the Schleswig-Holstein-Sonderburg-Glücksburg line did not have any rights to the Danish throne despite being male line descendants of King Christian III of Denmark, Norway and Sweden. At the time of his birth only the lines descended from King Frederik III of Denmark had succession rights. The twin duchies of Schelswig and Holstein, the line of Christian’s family, have a very complex history. At times they were claimed by both Denmark and the Holy Roman Empire. During the life of Prince Christian the claims to the throne of the twin duchies would become an issue for not just him but all of Europe. I will go further into the history of the succession of the twin duchies next week. Christian was also a descendant of the Danish kings through his mother, Louise Caroline of Hesse-Cassel. Her father was Landgraf Karl of Hesse-Cassel and her mother was Princess Louise of Denmark the daughter of King Frederik V of Denmark and Norway and his first wife, Princess Louise of Great Britain and Hanover (a daughter of King George II of Great Britain and Hanover). In his youth Prince Christian was an unsuccessful suitor for the hand of the young Queen Victoria of Great Britain. He was rejected and ended up marrying his first cousin, Princess Louise of Hesse-Cassel, the daughter of Hereditary Prince Frederik of Denmark and Norway (son of King Frederik V of Denmark and his second wife Juliana Maria of Brunswick-Wolfenbüttel) and Duchess Sophia Frederica of Mecklenburg-Schwerin. Because of the laws governing succession to the Danish throne, Prince Christian’s wife had a better hereditary claim to the Danish throne that he himself had. Christian and Louise married at the Amalienborg Palace in Copenhagen on May 26, 1842. 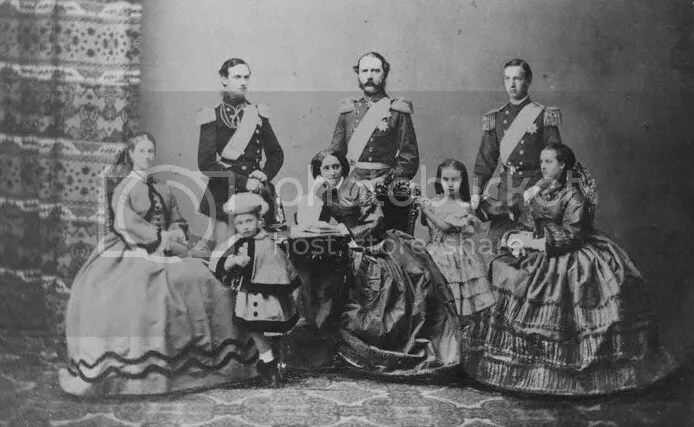 They had 6 children: Frederik (1843), Alexandra (1844), Wilhelm (1845), Dagmar (1847), Thyra (1853) and Waldemar (1858). This is my introduction to King Christian IX. I included some necessary genealogical background and next week I will discuss his succession to the throne and his reign and the extended family he had. The last three days of this week I will spend on the topic of royal numbering by examining the three Scandinavian kingdoms of Denmark, Norway and Sweden. Norway: Norway shares a similarity with England in that prior to being a unified kingdom Norway consisted of several smaller kingdoms. Harald I Fairhair King of Norway from 872 to 930 is said to be the first king of a unified state. Most early kings of Norway are known more by their sobriquet than their ordinals. During the history of Norway the problem with numbering the kings is that there were times when brothers ruled jointly or there were rival kings. All in all the numbering has been consistent with all the names except for the name Olaf. Olaf Magnusson was king of Norway 1103-1115 and was the son of King Magnus III Barefoot and Sigrid, daughter of Sakse of Vik. Olaf was a co-king together with his half-brothers Sigurd Jorsalfar and Øystein Magnusson after his father Magnus died in 1103. He was king of Norway in twelve years, but did not like their brothers leave a lasting impression. He died at the age of 17 and and never ruled his share of the kingdom on his own and his brothers acted as his regent on his behalf. Historians judge him as to be insignificant and when numbering the kings of Norway they left Olaf out from numbering. He should have been counted as Olaf IV but that ordinal was assigned to King Olaf Haakonsson (1380-1387). In the middle ages Norway and Denmark, along with Sweden formed the Union of Kalmar in 1397 uniting all three Scandinavian states under one Monarch. Sweden broke away from this union in 1523 and the union of Norway and Denmark lasted until 1814. However in 1814 Norway was not able to gain its independence and fell under the control of Sweden. It wasn’t until 1905 when Norway became an independent state. They chose a monarchical form of government and chose the second son of King Christian IX of Denmark, Prince Carl of Denmark as their king. He chose the Norwegian name of Haakon and became King Haakon VII and he ruled until 1957. His son, Olaf V of Norway 1957-1991, reigned using the ordinal “V” but would have been Olav VI, had the co-king Olaf Magnusson been numbered and not ignored by historians.